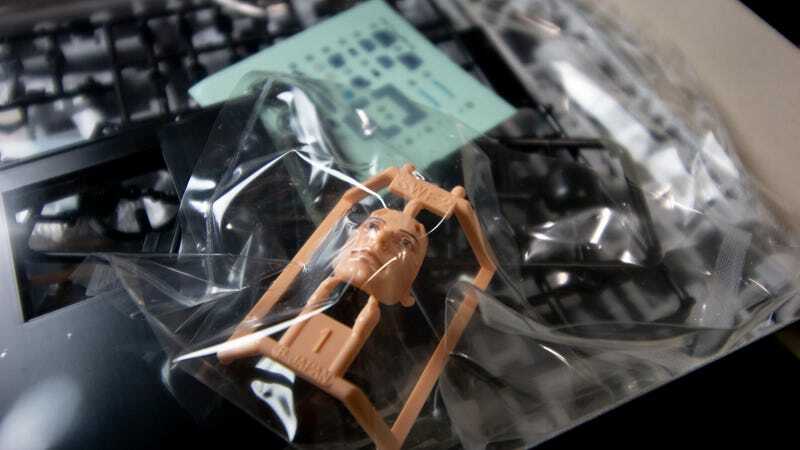 Picking up an action figure of your favourite character at the store is all well and good, but what if you could spend several hours assembling one from scratch? 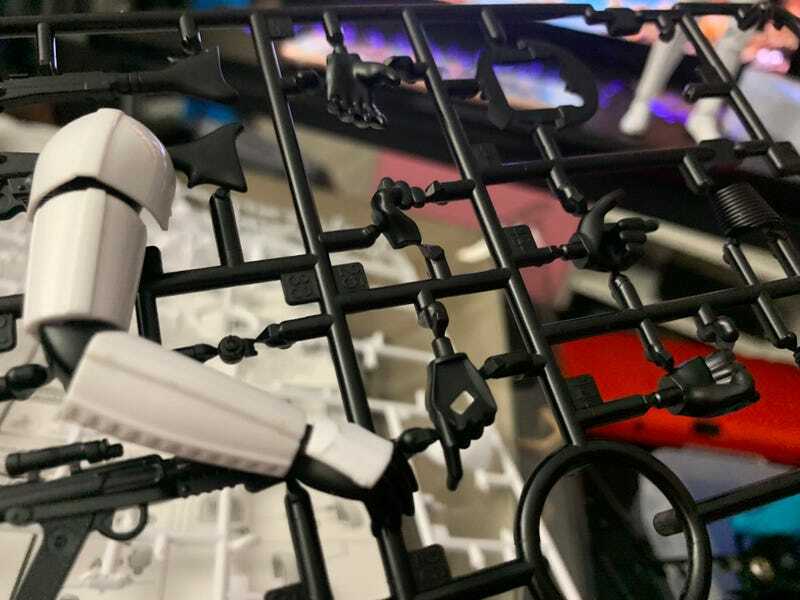 Putting together these Star Wars character kits from Bandai and Bluefin is a lot more fun than it sounds. When I was a child, my father used to let me watch him assemble model kits. He was a car guy, so he’d take on the really fancy sets, the ones requiring glue and paint and sanding. Me, I am more of an impatient, snap-together sort of guy. Give me an X-Wing kit with some stickers and painting suggestions and I will give you an unpainted X-Wing with no stickers. 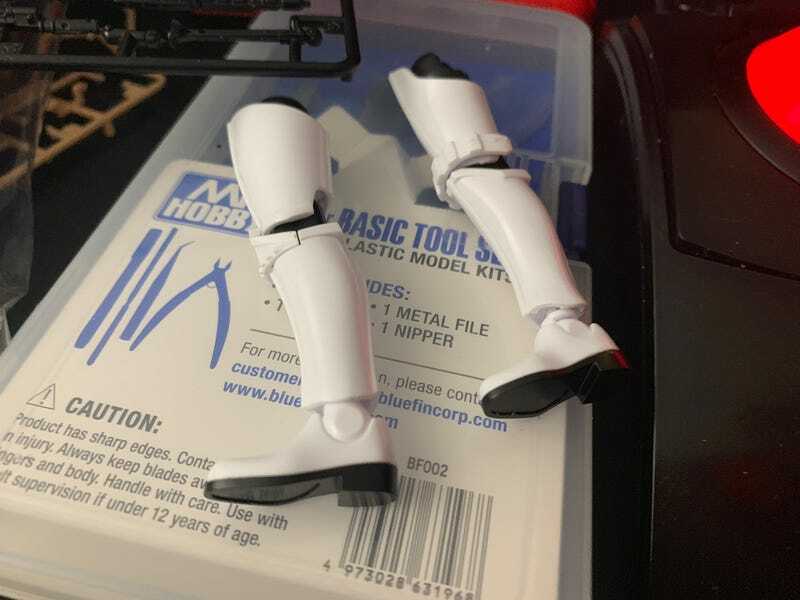 So when the folks at Bluefin offered me a chance to snap together some of Bandai’s Star Wars character line kits, I jumped at the chance to ignore the stickers and leave the special model lining marker in my Mr. Hobby tool set capped. Bluefin sells the Bandai Star Wars kits on its website, though there’s a much larger selection available on Amazon. Prices range from £15 to £50 or so, or about the same as a pre-built premium figure. Bandai’s assembled a nice little roster of Star Wars characters for their model kit line. From old school Clone Troopers to New Order Stormtroopers, the entire saga is covered. 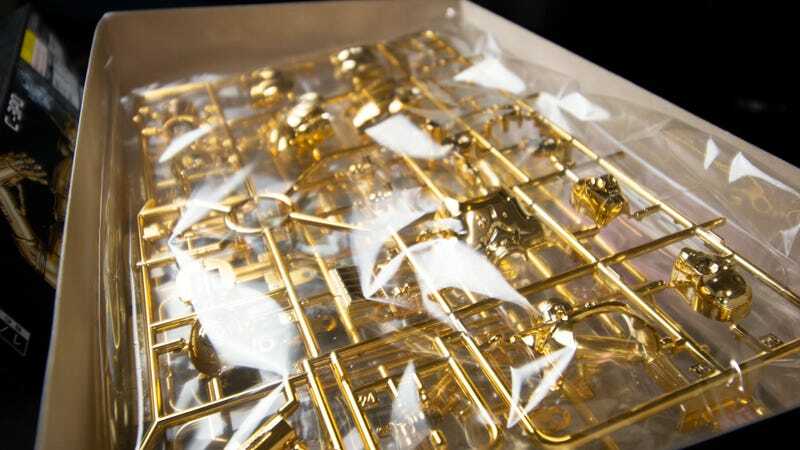 I selected two kits to get me started — C-3PO, because he is all shiny, and the Stormtrooper version of Luke Skywalker, because I wanted to see that face. Yes, that creepy face. Look at it, just sitting in its frame, all painted and precious. It’s so disturbing. I love it. Assembling the kit is not something I can do bare-handed, so I grabbed my trusty Mr. 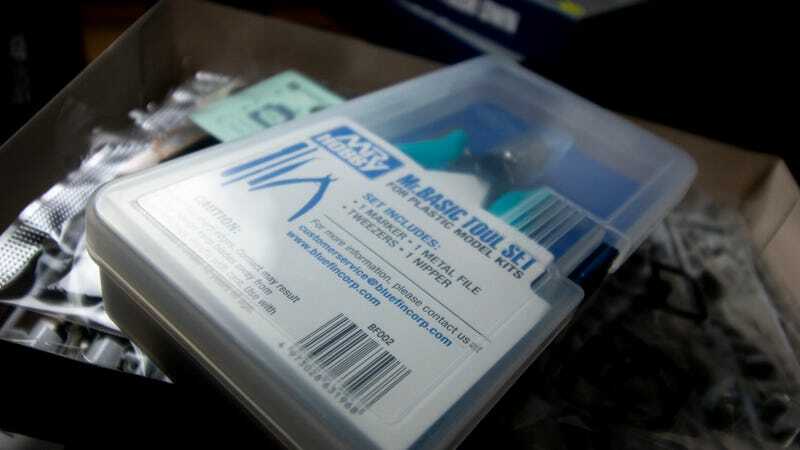 Basic Tool Set, which contains a marker I never use, a pair of tweezers I forget until I’ve dropped a smaller piece a dozen times, a metal file to fix my screw-ups and the all-important nippers. I know what you are thinking. Is there a Mrs. Basic Tool Set? If there is, she doesn’t mind me messing with her man. The tools are important, especially since I am not as flexible as I once was. Earlier this year I suffered a medical issue that left me paralysed from the chest down, and while my upper body is pretty good, my arm and fingers get a little numb now and then. Part of the reason I decided to build these was to prove I could still do it. I sort of can. Mostly. It’s not as daunting a project as it first looks. Once you start snipping the first few plastic pieces off their frames, it’s easy to get into an assembling groove. 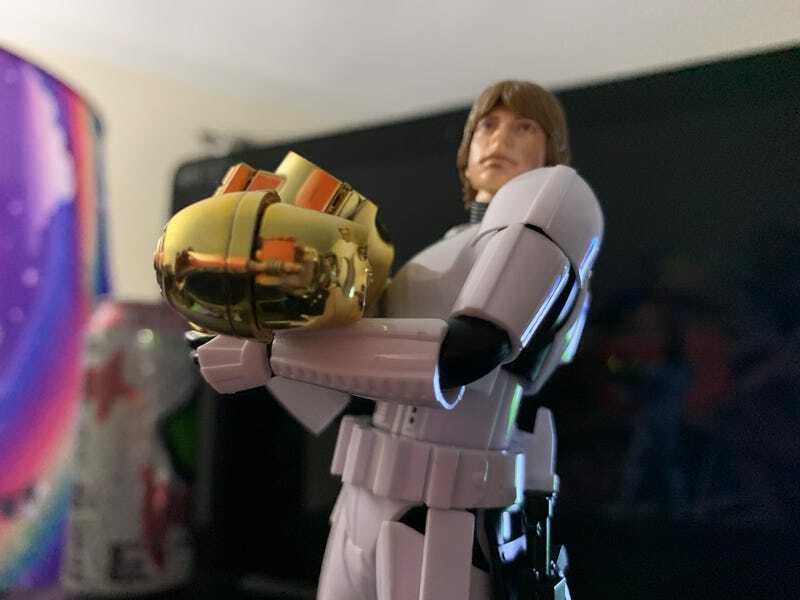 First you do the head. Then you stare at the head for like 20 minutes, because damn it’s so weird. 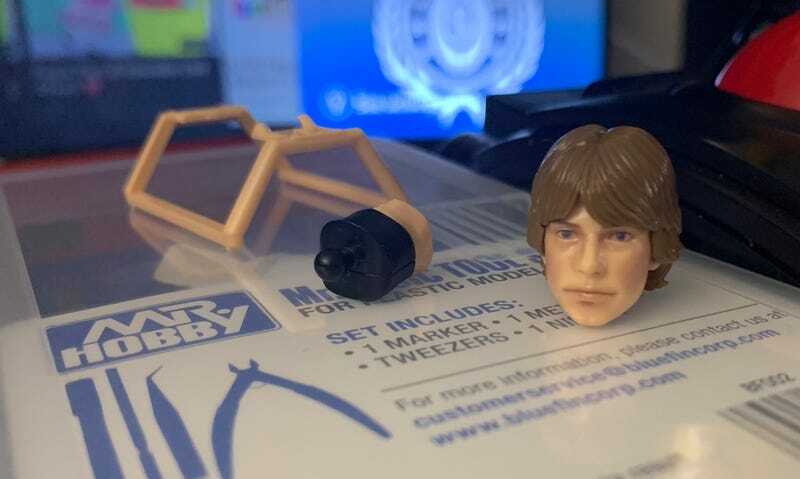 Little Luke head, just sitting there on my desk. Hey, Luke. 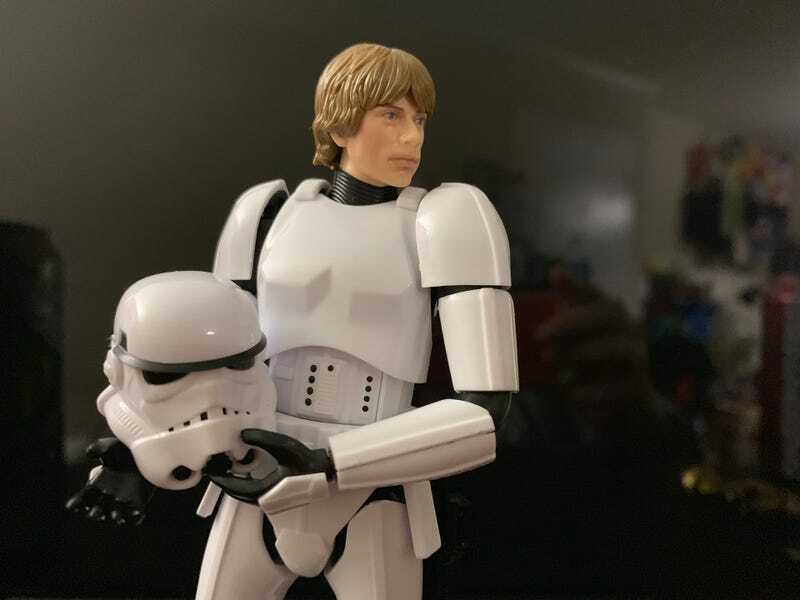 The Luke Stormtrooper kit body is actually rather neat. There’s an underlying black body that the white armour wraps around. It gives the finished product the look of a guy wearing a protective suit. ... and arms. The kit, like any premium action figure, comes with a variety of different hands. Some are built specifically to hold the weapons that come with the kit. Guns aren’t going to get dropped when they are moulded to the palm. The partial hands connect with weapons. All in all, assembling Luke took me about three hours. It would have been less, but there were a couple of small bits involved that I kept dropping with my big dumb fingers, and it’s not easy picking things up in a power wheelchair. Mind you, my version of the finished product doesn’t include decals, marker lines or additional painting. Perhaps one day I will trust myself with a tiny brush and paint fumes, but not today. 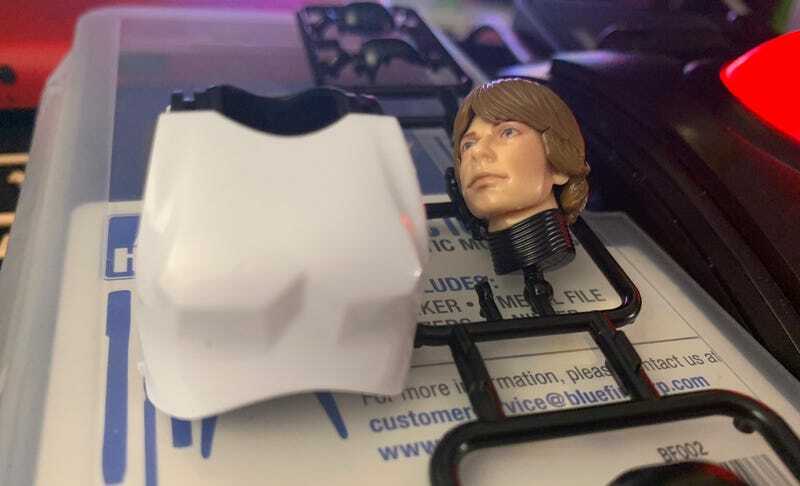 The Stormtrooper mask can also replace Luke’s head, freeing it up to slip into people’s drinks when they aren’t looking. 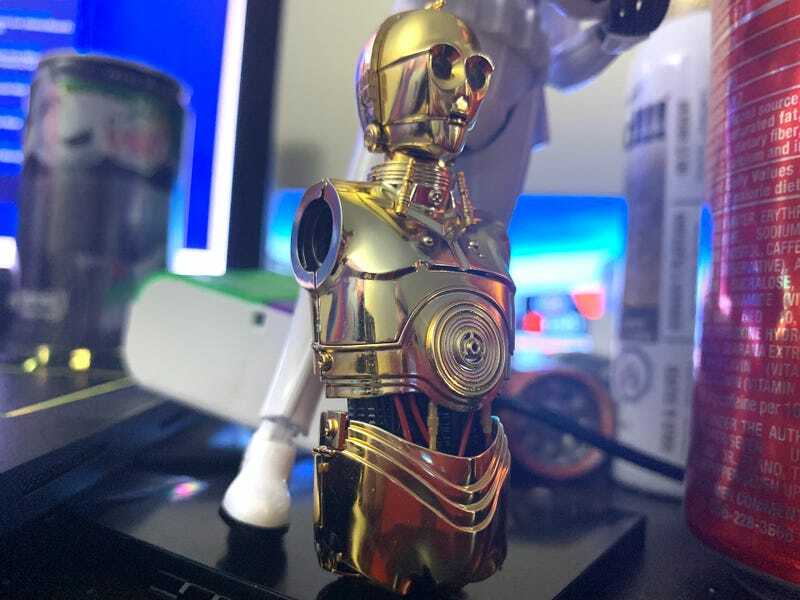 As for C-3PO, let’s just say I am almost done with him. He’s a bit more complex of a build. For one, he’s super shiny. And he is also mega detailed. There are tiny metal bolts in his torso and head that I must have dropped a dozen times. Eventually my wife, who hasn’t spent her entire life staring at a computer, took the pieces away from me and put them together herself. He’s coming along nicely, however. I’ve got his head, torso and crotch crafted. I did manage to break one of the yellow wire details in the bit connecting his upper body to his waist, but you can hardly see it. See the little pieces sticking up from the chest to the neck? Screw those pieces. 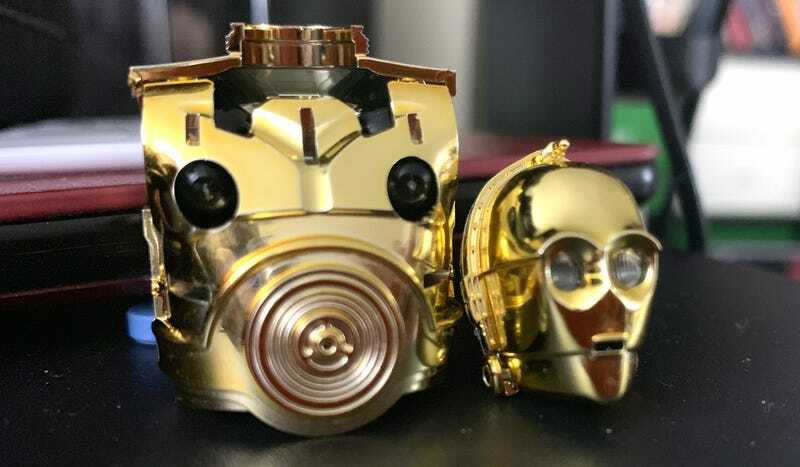 If all else fails, Bandai was thoughtful enough to include damaged versions of some of C-3PO’s parts, including a face with a popped-out eye. I can always swap out the pristine bits for the battered ones and pretend I meant to damage him. For now, C-3PO is safe in Luke’s arms, completely oblivious to the fact that he was originally built by the human’s father. It’s fate that brings them together. This pose made possible by strong joints and the handy included stand. 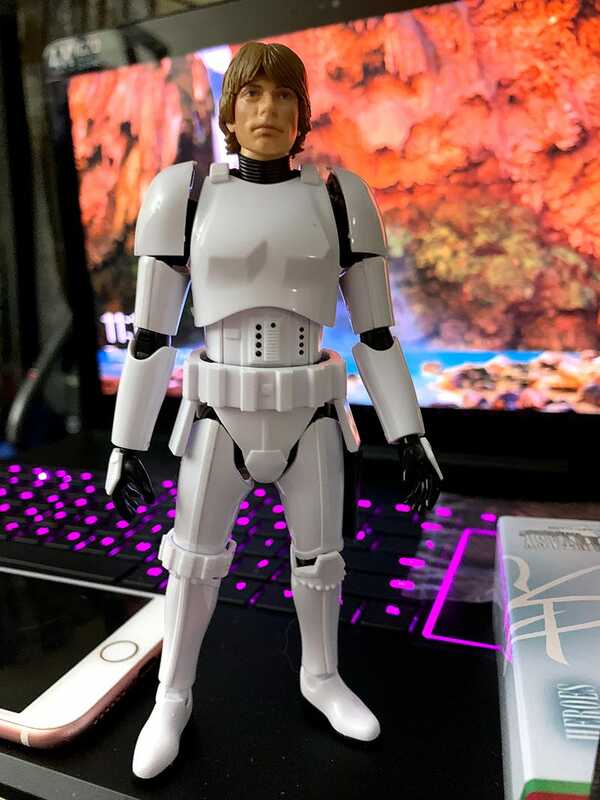 I’m enjoying the Bandai Star Wars character kits much more than I do traditional Star Wars action figures. There’s a strong sense of accomplishment that comes from turning a box full of plastic bits into a fully articulated and recognisable character. I’m even proud of the bits I screwed up. Those are my bits.